Beachfront with great sea views. This villa, with all day sun, is in the best location within this modern well laid-out complex with heated swimming pool and spa. A few steps to a very safe beach – swim, launch the boat, kayak, windsurf. Or if you are feeling more adventurous this a great spot to base yourself; there are many other things to do within just a 30 minute drive. 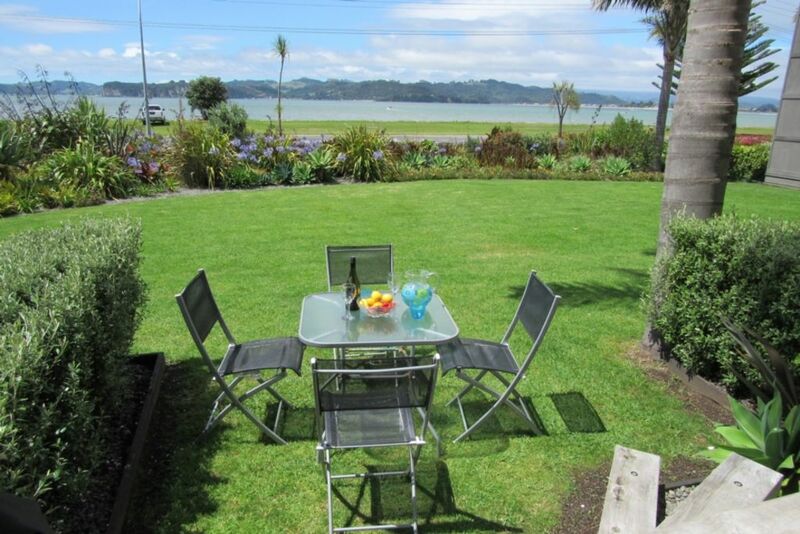 An easy walk to Whitianga township or a short drive. Two bedrooms sleep four comfortably. Quality furnishings. An easy walk or short drive to Whitianga township for a good coffee or meal out. Great spot, stunning outlook. * Catch the ferry across to Front Beach (a lovely sandy beach) and stop at Cooks Cafe (Ferry Landing) for a whitebait fritter. * Dig a hot pool at Hot Water Beach (at low tide) and while there visit Moko Artspace (24 Pye Place). * Visit a local cafe. * Go on a sea kayak tour with Cathedral Cove Kayak Tours (0800 529 258) from Hahei Beach to Cathedral Cove. * Visit the hot pools at the Lost Spring (121A Cook Drive) and have a spa treatment while there. * Do a charter fishing trip and catch your own dinner. * Grab takeaway fish and chips. High season rates apply for Easter and Scallop Festival. The apartment was faultless. It was sparkling clean and had all the comforts of home. It had great views across the bay and only a very short drive to shops and supermarkets. One can walk along the bay for a long way and drive to places like Cathedral Cove and the Hoter Water Beach. You can also enjoy a further drive to Coromandel as well. It is well worth the drive to get here. Terry and Lynne from Sydney. Grest 2 br unit that is clean modern and professional. Fabulous apartment in a great location right next to the beach. Fabulous apartment in a great location right next to the beach. Felt comfortable straight away. Lovely place, bright and sunny, across the street from a beach. Lovely place, bright and sunny, across the street from a beach. It wasn't the best beach we saw in New Zealand (most were stunning!) but still beautiful, swimable, lovely to walk along and look at from the home. Very central location. Home is nicely furnished and decorated, just a pleasure to stay at. Only used the pool once, small but functional, as the weather was perfect for beach time! Would highly recommend for a Coromandel vacation!